Creativity flowed at Whitman Post Elementary and Rockton Grade School on Thursday, April 4. A project fair included 80 projects at WPES and 95 projects at RGS. In the WPES gymnasium an eye catching display of different lighting methods were seen at “The Battle of the Bulbs assembled by Jacob Dirx. How to make a lava lamp, bearded dragons, dolphins, popcorn, and the inner workings of a computers motor board just tap the surface of featured subjects studied and presented by students. Lilly Jobst and Evie Mikos teamed up to bring “Ocean Zones in a Jar” to life through a display moving from the ocean sub zones of sunlight, twilight, Midnight, and trench. Micah Poirier was dressed in a stunning purple dress that she wears for dance; her chosen subject. Sea creatures were a popular choice. Ben Forsythe chose to do his project on sharks. Elleana York learned details about dolphins. Fourth grade students Clare Turner, Gabby Behnke and Bella Riggins worked together to learn and to teach about the Solar System. Each young lady researched three fun fact based on the questions, “Where are specific parts located in our Solar System, or what something is made of. All who stopped by their spot were treated to looking through a real telescope to catch fun and interesting details. Live bunnies were spotted at the “Hippity Hop, A Lex and a Lop” display. Behind a board full of interesting facts and adorable bunnies was the thoughtfulness of Berkely Stringham and Charolette Lazansky. Emma Caver took visitors through a journey of “Girl Power.” This project focused on Woman’s Rights from the 1500’s until the present day. “This year the creativity is phenomenal,” Fourth grade teacher and WPES Project Fair Coordinator, Ruth King said of the WPES projects. Great fun was had at Kaitlin GeRue chose to do her project on “How to make bubble gum.” GeRue had three different flavors to try; raspberry Kool-Aid, raspberry Jello, and grape flavored candy powder. Nolan Fish honored the memory of former President Abraham Lincoln with an eye catching historical display. 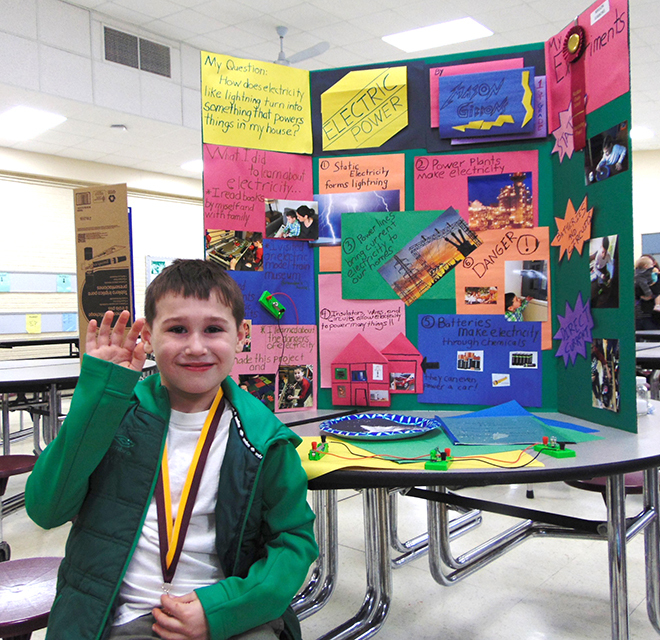 Chosen as an “Outstanding Project” was Mason Gibbon’s intricate outline on electricity. Projects were voted on and each student received a medal for participating. Ribbons which appeared on specific projects were awarded for showing exceptional knowledge and enthusiasm for those projects. Burie credits parent volunteers and community members who help with the judging process. “We could not do it without them,” Burie said. “Once again the students and families showed great creativity and hard work! The projects were very well done and very informative. I love to see what sparks the students interests,” Burie shares.